I have used a lot of the body products and love them so decided to purchase this set to try the face products, I was not disappointed, my face is brighter and the products smell devine, the optimal skin Pro cleanser is amazing, my skin feels so clean and smooth, will be investing in the full size products. As always espa does not disappointing very happy with my purchase. This is a great selection of my favourite ESPA products, plus a chance to try the shampoo and conditioner which I look forward to as I am a fan of pink hair and scalp mud). I was a little disappointed with the case itself as it has no inner pockets or elastic to keep everything organised. Also it is not rigid, but soft-bodied. When I first travel with it, I will use the case with the foam insert to keep the products neatly and invitingly displayed upright. However as a longer term travel case it could get quite chaotic with no other means of separating additional products or keeping them upright. I had quite high expectations for this vanity bag and was thinking it will be big . But it’s very small although it fits quite a lot of products and is more suitable for travelling . But if you really think of having as storage for your make up bag it’s not enough space . 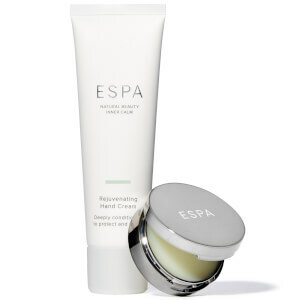 All products are quite small size as more suitable for travelling and for those who is on the go and wants to try ESPA products. In general it’s quite nice vanity bag and will make a good addition on every woman’s desk. Purchased this for my partner for mothers day. She absolutely loves it! This is a great collection with everything you need for a long weekend or holiday away. My skin felt lovely! This is a beautiful set full of really useful items. So nicely presented and a lovely gift to give. This is amazing stuff!! Yes some of the products are small or sample size- but you are paying for the optimal oil - which is amazing!! It lasts a long time! It is worth the money! I like to sample products to make sure they work and that I don’t have any reaction to them. The pink mud does work- I have long coarse hair and I can feel it work as soon as I put it in. These products work so well you need very little to do the trick! ESPA products are the best beauty products available.